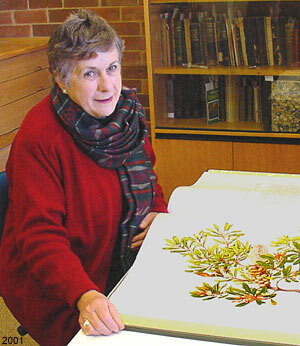 The Hunt Institute has a long history of presenting top quality botanical art exhibitions. The next exhibition to take place is entitled Virtues and Pleasures of Herbs through History: Physics, Flavor, Fragrance and Dye and runs 22 March - 29 June 2007. The Hunt Institute for Botanical Documentation is a research division of Carnegie Mellon University, Pittsburgh, Pennsylvania. 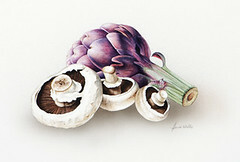 Anna Knights is one of the newest members of BotanicalArtistry.com and has recently been awarded the Dawn Jolliffe Botanical Art Bursary from the Royal Horticultural Society. The RHS picture committee described her work as "very bold and executed with great energy". The Eighth Biennial Exhibition presented by the Friends of the Royal Botanic Gardens, Melbourne will be held in Domain House, Dallas Brooks Drive, South Yarra from 11 to 26 November 2006. This is always a wonderful exhibition and attracts artists of the highest standard. It is well worth visiting if you are in the area. Further details and online catalogue on this page. Handprint.com really is the most exceptional site. It contains information and technical data on just about every aspect of watercolour painting. But first a warning - this site is so interesting and so big that you are bound to spend a lot of time reading it! The site is divided into a number of main sections: brushes, papers, paints, palettes, technique, colour vision, books, retailers and links - really everything you could want to know about watercolour paints. Celia Rosser, one of the most talented botanical artists of the last 100 years has had the honour of painting the Banksia named after her. Banksia rosserae was discovered in the year 2000, but its bright yellow flowers had not been seen since last month. Only 27 plants have been found in the wild and the location is kept a secret. The Age reports that last month Ms Rosser, 75, flew to Perth and drove hundreds of kilometres with a party of botanists and Banksia enthusiasts to witness the flowering of the plant. The Dawn Jolliffe Botanical Art Bursary was established in in June 2005 to assist a botanical artist to exhibit at one of the RHS shows, or to travel in order to paint and/or draw plants in their natural habitats. Preference will be given to artists who are not yet established. The value of the award will be up to a maximum of £1,000. This bursary is to be awarded annually by the RHS Bursaries Committee in association with the RHS Picture Committee. The focus for discussion at the Educators’ forum held at the 2005 American Society of Botanical Artists (ASBA) Annual Conference at Minneapolis was the preparation of guidelines for instructional programming in botanical art. The idea attracted positive comments from the majority of teachers present who were keen to see the concept progress. The guidelines would create a benchmark so organizations offering courses that were compatible with the guidelines could use this as part of their promotional material. Students would receive basic instruction in a set of core subjects that would enable their newly gained skills to be widely recognized and to be better prepared for undertaking intermediate and advanced classes and workshops anywhere where these guidelines are recognized. Two competitions of interest to botanical illustrators are open for entries during May. The first is the Margaret Flockton Award which is open to Australian and overseas artists producing scientific botanical illustrations of a high standard. Prizes of A$5000 and A$2000 respectively will be presented to the first and second best entries. The second is the Waterhouse Natural History Art Prize. This competition has prizes of up to $30,000 and is open to Australian and overseas artists. What is the difference between botanical art and flower painting? In general, flower painting is a term that can be used to describe any painting consisting predominantly of flowers. These can be anything from still life to botanical studies, or impressionistic garden scenes. It is usually more concerned with the beauty of flowers and capturing the colour and emotion of the subject. The medium can be varied - oil, watercolour, pastel, acrylic etc. It is also, by definition, concerned only with flowers and not other botanical subjects.